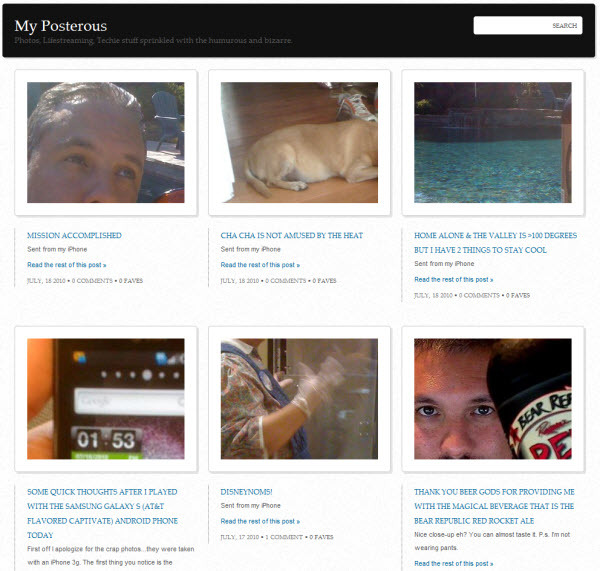 Posterous has been adding many more themes lately to their service. A few weeks ago I noticed that Drew Olanoff had a sweet looking theme on his Posterous that reminded me of the default theme used by SweetCron. I really like how items are displayed on the home page when using that styled theme so I decided to take a look if it was a new one added to the service, and sure enough it was. To change your current theme to this new one all you need to do is visit your Manage page and then click on “settings” and then click on the big “Theme and customize my site” button. Then scroll down to the theme titled “MyList” and select it. That’s it. You will now enjoy the look of your Posterous site in the way of a grid of pretty thumbnails displaying your posts. i saw sweetcron and my finger clicked then i realized it ..
not sure why but the days before Yong Fook left sweetcron where sort of magic(maybe it was the timing as far as lifestreaming ), i am not even sure what’s up with sweetcron now. I believe they forked it and i believe its now lifepress-php instead .. i need a nice theme for poster…’s so will be taking your suggestion. need to display high end jewelry so the grid will do the trick well !! Do you remember my wordpress plugin for sweetcron , you wanted to play around with it hen it was up on my sandbox ? i finally got a seamless look with wordpress driving sweetcron in a fully dynamic environment and the core code stopped being updated as Jon(Yong Fook) announced that Posterous is actually a better platform then sweetcron and he is moving to it ,lol..
Must admit its a stylish move but made be so mad ..
i have an idea involving lifestreaming sensitive data streams with eventual marketplace injection called FakePolice.com i already ran a successful focus group like experiment via @FakePolice to get my proof of concept first and actually made few discoveries along the way that lead to a very solid blueprint. Imagine BBB (better business….) 2.0 niched in authentic branded goods vs counterfeits on social grid involving what i would call topic streaming . thats why i even built that whole wp cms+sweetcron lifestreamer app. it was to be the exposer of counterfeit activity as it took place but i already gave to much away … to be continued ? wow,just realized how long this what ever you call it,comment ? is.lol.. feel free to edit or not publish as i will completely understand.. I am a big Fan Mark and always come here on all life-streaming matters!